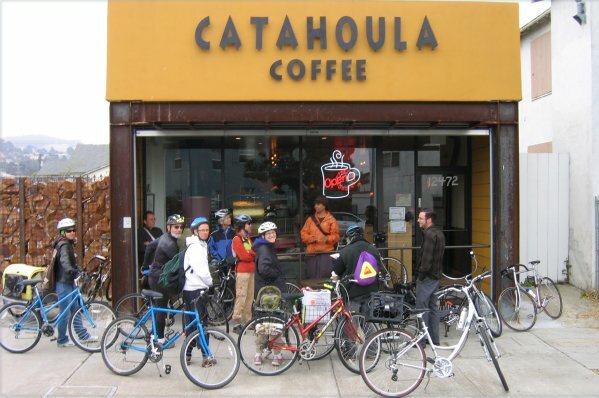 Over a dozen bicyclists, city staff on cyles, and cafe owner Timber met at the Catahoula Roastery on May 23, 2009 to assess the Barrett Ave. bike route in advance of the striping of bike lanes. Richmond Community Redevelopment project manager Chad Smalley has already secured a grant to cover the cost of striping Barrett from San Pablo Ave to the Richmond Parkway. The Ride started with a briefing and safety outline by Brian Drayton and culminated in a side trip to Keller Beach along the Miller Knox Shoreline where Richmond Spokes staff had a sumptious barbeque ready for the riders. Following lunch, most cyclists joined the optional leg up the Central Richmond Greenway to consider first-hand the East-West Greenway connection conundrum on Ohio and 23rd. Continuing on to Carlson and Ohio, the group was joined by Recreation & Parks Commissioner Corky Booze (on his bike) who conducted a briefing and tour of the not-yet-complete Carlson to San Pablo leg of the Greenway. This included a stop to look over the disputed connector at 35th and Ohio. The route ended at the Caltrans I-80 overpass at the eastern terminus of the Greenway, a round trip of approximately 10 miles. Richmond Reality Rides are organized and conducted by Brian Drayton and Doria Robinson of Richmond Spokes in order to "...get out and ride together while envisioning and co-creating a different, more sustainable future for Richmond..."
Each cyclist takes reponsibility for observing selected conditions (e.g. hazards, signage, striping, family friendliness, road conditions) and data is collated at predetermined points along the route. Results will be posted by Richmond Spokes who are documenting the entire process as input to a Richmond Bicycle Master Plan.